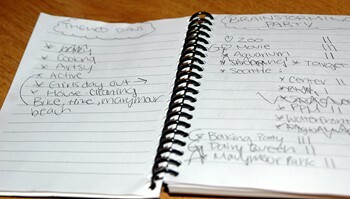 For this week’s SPF, Kristine asks us to show us our To Do Lists. Hmmm…. I kinda cheated. This is technically KT’s list but it involves us all, so I figure it’s fair game. Under KT’s gentle guidence (with perhaps a little bit of help from her mother) we came up with themed days to plan our week off. Much to our little dictator’s disapppointment, we haven’t been following our carefully planned list very well. Perhaps this has something to do with the fact that we’ve all been staying up very late and not getting up until noon or so???? OOOOH! I’m the first to comment I’m the first to comment! And I think that staying in bed until noon generally tends to wreck mot daily plans. I didn’t play this week…….too much drama over here. Patsy-I’m not the one sleeping in…it’s those lazy grandkids of yours. Jamie-I’m hoping you have good news today…I’ll check soon. Love it! I used to be that person too, but I am learning how to go with the flow. An entire week off for mid-winter break? Do they get spring break too? Wow! I’ve actually been better about doing things on my list. When I was young, I would get upset if things didn’t go the way I had planned. Then I stopped planning for awhile. And now I’m getting close to a happy balance. It’s only taken me some 30 years or so!